Ernest William Soundy: born at Lake Villas, New Hinksey in 1895 and baptised at St John the Evangelist Chapel, Vicarage Road on 10 November. The registrations of the above births between 1879 and 1894 were in the Abingdon district; but New Hinksey was taken from Berkshire into the City of Oxford by the time of Ernest’s baptism in 1895. St John the Evangelist Chapel was built in Vicarage Road, New Hinksey 1870 but the area remained in the parish of South Hinksey (St Laurence). At the time of the 1881 census John’s parents were living at Church Lane, New Hinksey, Berkshire (now renamed Vicarage Lane, Oxford). His father Henry (27) was now a clothes cleaner (as his father had been before him), living with his wife Sarah (29) and their first three children: Thomas (4), Rosina (3), and Ada (2). By the time of the 1891 census their address is specified as 1a Church Lane in New Hinksey. Despite now having eight children including a one-year-old baby and another on the way, John’s mother was working as a laundress, probably helped by Rosina (14) who had no other occupation. John’s eldest brother Thomas (16) was a printer’s machine boy, and Ada (12), Sarah (10), Laura (7), John himself (5), and Annie (3) were all at school. By the time of the 1901 census, New Hinksey had moved counties and was part of of the city of Oxford, so although the family’s address was now Church Lane, St Aldate’s, it is likely to have been the same house in Vicarage Lane as before. John (15), who was now working as an errand boy, was no longer at home with his parents: he was living with his elder brother Thomas (25) and his wife Ellen at 24 Lake Street. His mother (50) and sisters Rose (23) and Ada (22) were all working as laundresses at 10 Church Lane, while another three of his siblings were living in a separate household nearby at 6 Church Lane: Laura (17), who was a domestic servant; May (8); and Fred (7). On 16 May 1909 at the new St John the Evangelist Church in Vicarage Road (evidently in haste), John Edward SOUNDY (23), described as a labourer of Lake Villa, married Mary Margaret WHEELER (22) of 13 Church Street. She was born in Kennington, Berkshire in 1886/7 and was the daughter of the plate-layer Joseph Wheeler. Henry John Soundy (born at 18 West Street, Osney on 1 November 1914 and baptised at St John the Evangelist Chapel, Vicarage Road on 21 January 1915). At the time of the 1911 census, John was working as a labourer for a baker & coal merchant and living his wife and their first child, Rosina (1) at 54 Church Street, New Hinksey (now Vicarage Road, Oxford). John’s parents were still living nearby in Church (Vicarage) Lane, again occupying two houses there: his mother Sarah (59) was working as a laundress and living with her unmarried daughter Hannah Rosina (34), who was a laundrymaid; and his father was nearby with four of his children: Alice (21), who was a laundry maid; May (19); Frederick (17), who was a printer’s labourer; and Ernest (15), who was a carpenter’s labourer. John’s father Henry Thomas Soundy died in 1912 at the age of 57 (reg. Oxford third quarter). By the time his son was baptised in 1914, John Soundy was living in Osney, at 18 West Street. At the time he enlisted (probably in 1916) he was working as a packer in the Engineering Department of the GWR in Oxford. 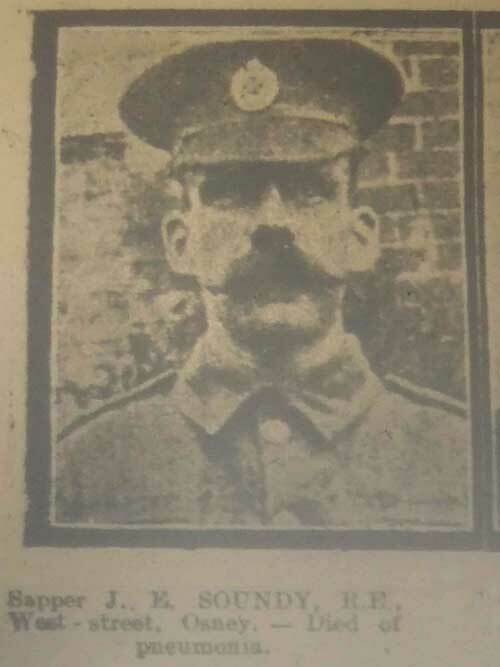 In the First World War John Edward Soundy enlisted in Oxford and served as a Sapper in the 273rd Railway Construction Company of the Royal Engineers (Service No: WR/295440). He died of pneumonia in Salonika after the Armistice on 5 October 1918, aged 33. He was buried in the Bralo British Cemetery, Greece (grave ref. 37). His photograph was published in the GWR staff magazine on 26 February 1919. He is also remembered on the Cowley St John War Memorial and the St John the Evangelist war memorial in New Hinksey, where his mother still lived. Frederick is not listed on the St Frideswide’s Church war memorial because he did not live there, but is listed with his brother on the St John the Evangelist war memorial in New Hinksey. Mrs Mary Margaret SOUNDY (born 1886/7) remained at 18 West Street and was still there in 1936. She never remarried, and died in Oxford at the age of 75 in 1962 (registered second quarter). Gladys Muriel SOUNDY (born 1911) never married. She died at the age of 98 at St Luke's Hospital, Latimer Road, Headington on 16 February 2010 and was buried in Headington Cemetery. Henry John SOUNDY (born 1914) married Alice M. ABBOTT in Oxford in the third quarter of 1939.